In Kristen Witucki’s emotionally gripping novel, young Tallie struggles for self-acceptance against other people’s expectations and beliefs, particularly around her blindness. Meanwhile, Benjamin, who works in reader services at the library, has become a solitary man. He lost his wife and daughter while he was learning to accept that he was blind. When Tallie reaches out to her library to find out if a cure for her blindness is possible, Benjamin answers. He advises her to accept who she is and learn to be happy as a blind person. The two form an unlikely friendship, helping each other to reflect and grow as individuals. The perspective changes throughout the book; some chapters are told through Tallie, others through Benjamin. Each phone call between the two constitutes its own chapter, clearly marking the intersection of their lives. These characters are completely relatable, and their unique experiences offer a rare, authentic opportunity to understand what life without sight might be like. Lush descriptions of sounds and smells are extraordinarily evocative. It is easy to feel how overwhelmed Tallie is by her new school, which is filled with the sounds of slamming lockers, chattering children, and the smells of body odor and food. It is easy to hear the last cricket of summer as Benjamin describes it: “a creaky little chirp once in a while like he forgot how the song goes.” Music is an important element in the development of both characters, and the emotion that they are able to hear and describe in a composition represents a depth of experience that will be new to many. 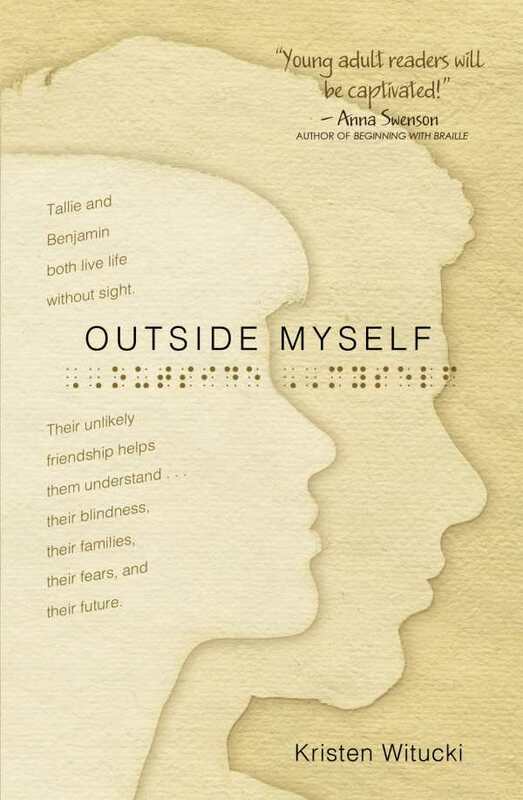 Outside Myself is a beautiful, moving book about two people living with blindness, but it is also about loneliness, friendship, and the impact that one person can have on the life of another.